Native views from iOS, Android, and UWP can be directly referenced from Xamarin.Forms pages created using C#. This article demonstrates how to add native views to a Xamarin.Forms layout created using C#, and how to override the layout of custom views to correct their measurement API usage. 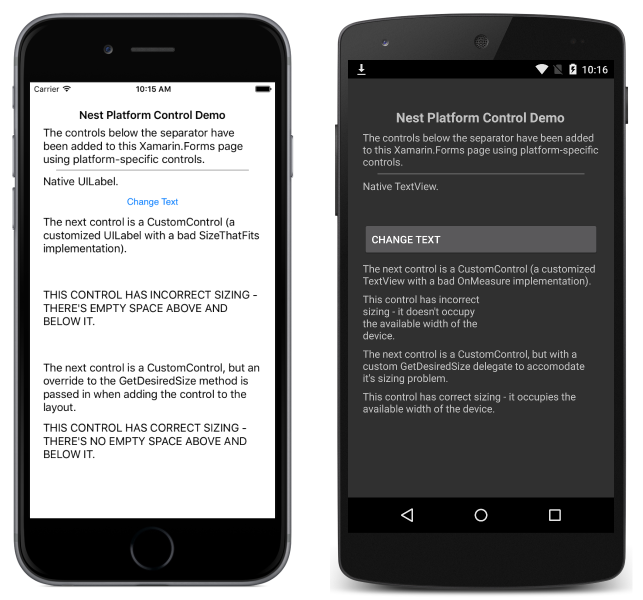 Any Xamarin.Forms control that allows Content to be set, or that has a Children collection, can add platform-specific views. For example, an iOS UILabel can be directly added to the ContentView.Content property, or to the StackLayout.Children collection. However, note that this functionality requires the use of #if defines in Xamarin.Forms Shared Project solutions, and isn't available from Xamarin.Forms .NET Standard library solutions. Add – adds a platform-specific view to the Children collection of a layout. ToView – takes a platform-specific view and wraps it as a Xamarin.Forms View that can be set as the Content property of a control. The following sections demonstrate how to add platform-specific views to a Xamarin.Forms layout on each platform. The example assumes that the stackLayout and contentView instances have previously been created in XAML or C#. Custom views on each platform often only correctly implement measurement for the layout scenario for which they were designed. For example, a custom view may have been designed to only occupy half of the available width of the device. However, after being shared with other users, the custom view may be required to occupy the full available width of the device. Therefore, it can be necessary to override a custom views measurement implementation when being reused in a Xamarin.Forms layout. For that reason, the Add and ToView extension methods provide overrides that allow measurement delegates to be specified, which can override the custom view layout when it's added to a Xamarin.Forms layout. The following sections demonstrate how to override the layout of custom views, to correct their measurement API usage. 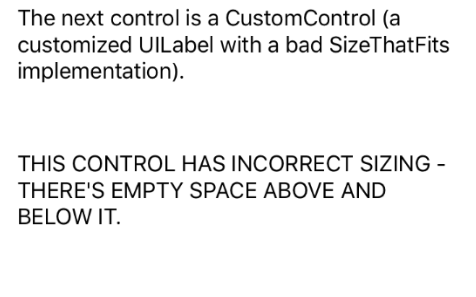 Text = "This control has incorrect sizing - there's empty space above and below it." // Force the width to half of what's been requested. // This is deliberately wrong to demonstrate providing an override to fix it with. Text = "This control has incorrect sizing - it doesn't occupy the available width of the device." This article explained how to add native views to a Xamarin.Forms layout created using C#, and how to override the layout of custom views to correct their measurement API usage.